Tuffy says: Almost Pobre is SOLD. This is a half brother to Almost Kyles. Another good colt with manners to spare! Good blue color with just a star. 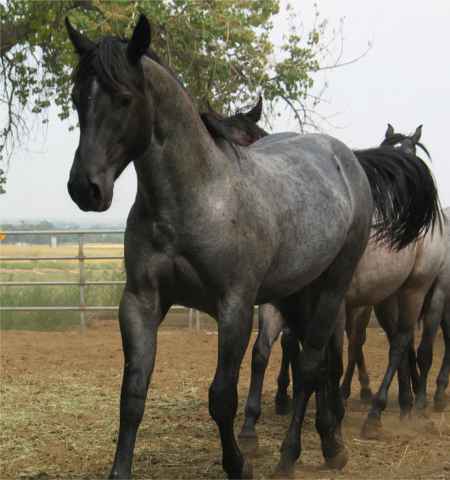 This colt has breeding similar to our horse AZULS SAN PEPPY. His bottom side has some really nice KING RANCH breeding. And being a grandson of BLUE'S BEARD who is a son of BLUE VALENINE makes this colt worth a double take. CONGRATS TO JERRY BROWN OF DILLWYN VA ON THE PURCHASE OF THIS GREAT COLT! THANK YOU JERRY AND GOOD LUCK WITH HIM!